Peter Krahenbuhl and Brian Mullis shared a vision of the “high profile contribution travelers and travel companies could make toward environmental protection and sustainable development.” So in 2002, they founded Sustainable Travel to make their vision a reality. A Leave From "Real Life"
An example of a vacation that meets the criteria for sustainable travel is one currently being taken by Nick and Sarah Weber, two archaeology students based in Vancouver, BC. This couple has taken a leave of absence from “real life” for one year to travel the world. Nick and Sarah recently traveled to South Africa where they spent part of their time volunteering with Educo; an outdoor education organization. According to Nick and Sarah Weber's newsletter, “Educo is an outdoor education organization that provides leadership development through outdoor-based experiential learning." 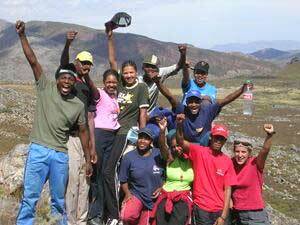 "Through the use of the wilderness, challenge activities and group experiences, Educo's courses aim to promote personal development. The courses specialize in running programs that deal with things like HIV/AIDS, life and dealing with death, child/youth care facilitator training, wilderness and leadership for adults and youth -- topics so different from one another that if you asked three different staff members to define what the organization does, you might get three different answers." 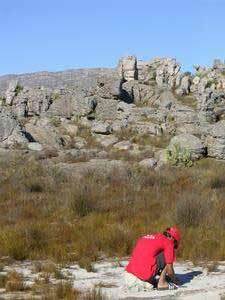 Nick and Sarah spent seven days volunteering with Educo students in a nature reserve titled Groot Winterhoek. 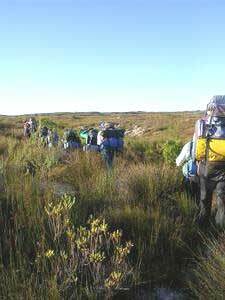 The nature reserve surrounds the Educo base camp which is located three hours north of Cape Town. Nick and Sarah explain, “We have been lucky enough to have an amazing experience volunteering on an Educo course. In one of our recent blogs we explained, as best we could, what type of courses and philosophy make up Educo and now we have experienced the magic for ourselves. Journal reflections during a trip. We headed off last Thursday to pick up the students we would be working with. "All of the participants are from a university program called Tsiba. It is a new university focusing on training young people who otherwise wouldn’t be able to afford to attend post-secondary education to be able to go out into the community and make a difference in the business world. "On the first morning, after taking some time to write in their journals and reflect on some questions posed to them, we met up with the other group for a rock climbing session. This was an exercise in team building and reaching goals. Watching the two groups come together after only one night apart was magical. All of these students are amazing singers and dancers, so when they came together they sang and danced as one big group. "Right from the get-go my group worked amazingly well together especially when preparing the food. Other activities included a number of days of long walking in the hot hot sun, swimming in water holes, heading towards a peak, team building activities, and a solo. Through all of these exercises we helped the students to learn more about themselves and about their fellow students who will be with them for the next four years. "We had lots of fun watching the students do the team building initiatives. One of the most amazing activities of the week was the solo. A solo, as the name suggests, is where the students head out on their own for around 12 hours (overnight) to reflect on their life, their goals, their fears, or in general anything that comes up for them. The next day we all sat in a circle to listen to and respect what came out of this experience for them. I think this process was very worthwhile and even life changing for some of the students. You can read about Nick and Sarah’s yearlong journey at travelblog.org. 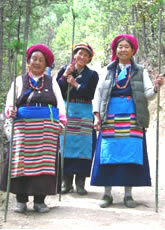 There are many different vacations and programs to choose from on the Sustainable Travel web site. These programs range from adventure travel, and eco-tours, to stays at Bed and Breakfasts and voluntourism. The eco-directory is “a unique destination guide designed to help you make responsible travel choices, so you can book and buy with confidence. If you do book with one of our members, please be sure to let them know how you found them!” There are numerous types of vacations including: biking, beaches/diving, arts, and culture, and numerous locations to choose to vacation in including: Brazil, Antarctica, and Africa. When asked what the components of an eco-friendly vacation are, Mullis lists many. A few examples are a vacation that “supports environmental conservation, supports sociocultural preservation through the support of locals; by making sure that the locals benefit from the tourists visiting their home, and the improvement of conservation from a national environment." Three major components are: “social benefits for the local economy, profit for business owners, and a gain for national and regional economies,” Mullis says. Previously, the main source of income for the inhabitants of Northern Laos was the poppy industry. With the benefits derived from eco-tourism/sustainable travel, the citizens of Northern Laos now have “another option they can control besides the drug industry, with the new option being more viable” Mullis explains. Lisa Mullis has also had the “great fortune to experience a number of eco-friendly resorts and tour providers. One that really stands out is The boat landing in Luang Namtha, Laos. All the huts on the property are eco-friendly, engineered and built by the locals. They sell handicrafts from area villages in the main lobby and as a welcome gift, they leave you a couple of local handicrafts in the room to take as souvenirs. "They serve all local dishes with food harvested on the property and in the immediate area. The food is EXCELLENT. They also have local musicians come in the restaurant as entertainment. They offer tours around in the area, again led by local guides. 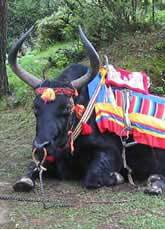 A water buffalo in Laos. Sustainable Travel not only provides an eco-directory for environmentally safe and beneficial vacations, but also provides services that reduce greenhouse gas emissions, and sell goods created by locals from economically disadvantaged countries. “Sustainable Travel International now offers MyClimate™, a unique service that reduces greenhouse gas emissions. Through the MyClimate™ program, travelers, corporations, travel service providers, and academic institutions can join our clients and supporters to take concrete action to fight climate change by investing in WWF-certified carbon offset projects that help to neutralize the negative impacts of their air and ground travel.” Mullis says. You can buy goods created by locals from economically disadvantaged countries through Sustainable Travel’s Brighter Future program. “Brighter Futures is a new concept within the Travel and Tourism industry and it has established a totally new relationship between tourists from economically advanced countries and producers in tourism destinations with economic disadvantages," he explains. Travelers can get involved in many ways with sustainable travel. According to the website, a few ways in which you as a traveler can help is by: becoming an educated consumer and seeking environmentally friendly travel options, supporting fair trade, joining the STI Advisory Board to spread the word about sustainable travel, and buying carbon offset certificates to mitigate the emissions impact of your travel. If you are still asking yourself what the main benefit would be to taking an eco-friendly, sustainable travel vacation, think of all of the jobs and revenue that you are creating for locals in the economically disadvantaged countries that you would choose to travel in. Sarah Freddie is a former GoNOMAD intern who graduated from UMass Amherst in 2007.